Heavy sigh. 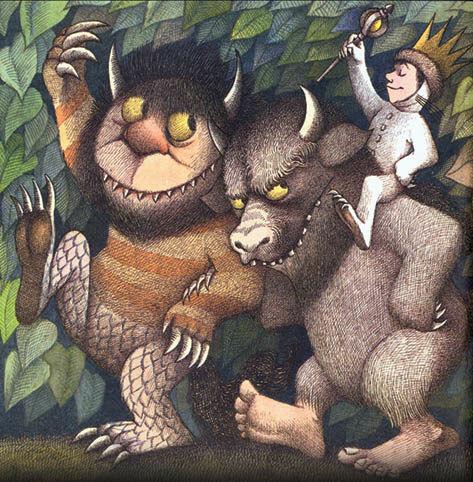 Maurice Sendak has died. I am moved, therefore, to say that the joy and pleasure I felt, when reading the following lines to my son when he was younger, cannot be overstated. So he was sent to bed without eating anything. It didn’t matter how many times I read it aloud, or later when we read it aloud together, I never, ever tired of it. Each and every time, those opening lines would cast a spell over me, as I was pulled totally and utterly into Max’s world. But there were two parts of the story that were particularly special to me, for I couldn’t help getting caught up in the telling, adding the following embellishments. And showed their terrible claws. …I would put the book into motion, as if brought to life by those terrible roars, and my voice would get louder and deeper and wilder, and I would draw the book right up close to my son’s face, to bring him up close and personal with the Wild Things. Honestly, it is entirely possible that I enjoyed this more than my son did. In fact, I’m pretty sure that, at least the first few times, it very well may have scared him a little, and, having read quite a bit about Sendak today, about how he rebelled against the sickly saccharin and sanitized children’s literature of the 1950s, I like to think he would have approved. And now,” cried Max, “let the wild rumpus begin! Rumpus, rumpus, we’re having a rumpus! …and I would sing it over and over again, and the book would go back into motion, my crude attempt at animating the static pictures of the rumpus, a glorious parade of Wild Things, with Max on the shoulders of one of the beasts, a revery, a celebration of wildness and freedom. Oh, and I guess there was one other embellishment. Where someone loved him best of all. …I would give my son a gentle and yet firm squeeze, as if to emphasize that I did, indeed, love him best of all. You have captured much of the same feelings and memories I have in reading this book to my daughters. Well said. There was an interview of Maurice Sendak with Colbert not long ago that is worth looking up if you haven’t seen it. Thank you indeed Mr. Sendak. I’ll check out that interview. Very sweet. He left behind an impressive legacy, so many books, stories, illustrations, the set designs for the Nutcracker that I take my kids to. But much of his legacy would be difficult to document, such as the lovely moments and memories that you shared with your son while reading Maurice Sendak’s wonderful books.